Motorcycle Transport Services, the Best Bike Movers in Town. 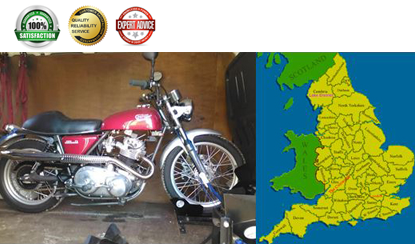 We are a specialist motorcycle transportation service, operating throughout England, Wales and the Scottish Borders. We are experienced in moving all kinds of bikes, from sports to vintage, cruisers to scooters, tourers to trial bikes; we have moved them all. We provide a complete, safe and insured Motorcycle Transportation Service. We take great care of every vehicle we are entrusted with and can provide transportation for most types of bike or scooter. If you need a custom vehicle delivered, or have to transport a sports bike to a special event we can help. Due to being owned by a bike enthusiast our company is totally in tune with the needs of today’s biker and will treat your bike with respect. If you have purchased a motorcycle via an Ebay auction or from a dealer we can help, also if you need to arrange delivery to a buyer our company can handle the whole process. Dedicated vehicles can be arranged.